Today I am sharing a technique that I've decided to call "Watercolor Detail Stamping". In many other English Speaking Countries, color is spelled colour and whenever I see it spelled that way it makes me smile. Anytime I correspond with someone from one of those countries I try to remember to use that spelling although it isn't second nature to me. I used to have a friend who lived in Manitoba, Canada and we had some lovely conversations about colour and colour combinations back in the late 90's early 2000's when I was a very devoted scrapbooker and she was the owner of a message board for scrapbookers I used to be on. Donna had a particular talent for enhancing die cuts using colored pencils. She lost a very short battle with pancreatic cancer in August of 2004 but I think of her often and smile when I remember our many talks. I even have Two-Page Layout (complete with a photo of Penguins) devoted to her in an album I did entitled "Rite of Passage - Journey to the Heart of Me". 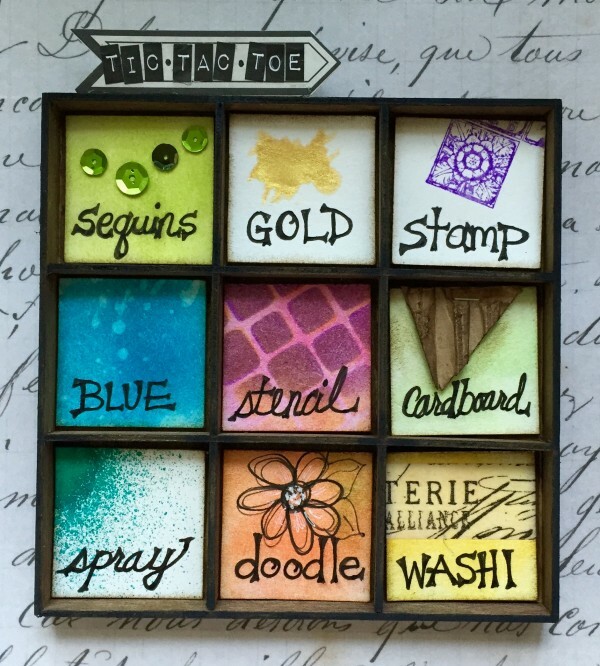 I saw this sketch Challenge #179 over at the CAS Colours and Sketches Blog and thought it would be fun to combine it with the Simon Says Stamp Monday Challenge which has a Tic-Tac-Toe theme this week. I chose the top row, with Stamping, Sequins and Gold. When I started working on my card for these challenges, seeing the spelling made me think of Donna so in part this card was inspired by her. The other part of the inspiration came from one of my sisters-in-law who loves pink and black together as much as I do. 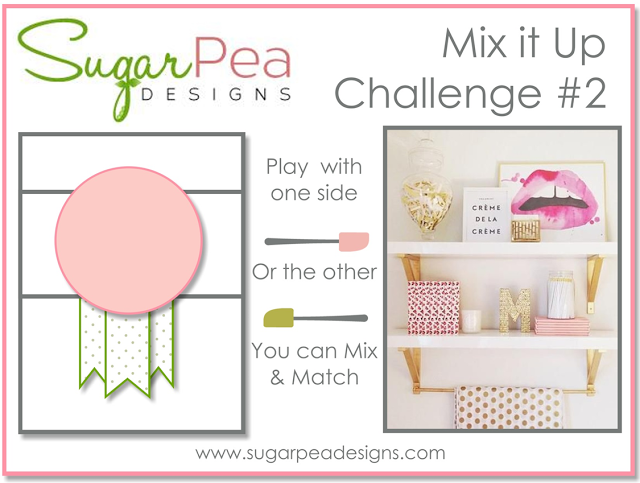 One of the options at the CAS (Clean & Simple) Colour Challenge Blog is to make a rectangle card into a square or vice-versa. I don't do too many square cards since they require extra postage if you use a square envelope. I get around this by using a 5 x 7 envelope but it bugs me a little that the card doesn't fit snugly so I don't do it too often. I also really love the combination of Pink & Gold together and decided it would make for a super elegant card to combine it with the black. I started by stamping the bloom and leaves from Altenew's Beautiful Day using Versamark and heat setting them with Ranger Gold Tinsel Embossing Power. I colored them with Lovely Lady and New Leaf Inks from Papertrey Ink by lightly misting my watercolor paper with a bit of water and then stamping one of the detail layers into the outline while the paper is wet. This moves the ink around nicely and it is a super fast way to get a hand water colored look with much less time spent. I love to watercolor but if I'm doing any kind of mass production, this is a great way to get the look without all the time. I found this method by experimenting with my stamps to see what it would look like and then really liked the results in the softer colors in particular. I'm planning to make cards for all of my Sisters-In-Law again this year at Christmas and some of them really like the watercolor look. This technique gives me the ability to do that for them. Once the paper was completely dry, I die cut the leaves and bloom using the coordinating Beautiful Day Dies. My card base is a 5.5 x 5.5 square note card made from Papertrey Ink True Black Cardstock. I cut a 5.25 x 5.25 white insert for the inside of the card. My pink square is cut from Lovely Lady Cardstock using the My Favorite Things Stitched Squares Stax Dies. For the gold square I cut a Spellbinders Labels 42 Decorative Elements in two sizes and then cut the small one from corner to corner to make the little tabs with a little creative cutting to help. The "thanks" die is a favorite from Mama Elephant and the 5 mm Gold Sequins are from Darice. Thanks so much for stopping by today and I hope you'll come back soon! You can subscribe to receive e-mail updates, and follow me on Facebook and Instagram. I'm going to confess right off the get-go here that today's project for the June 2016 Papertrey Ink Blog Hop was a struggle for me in some ways. As always, Nichole gave us a very interesting and thought provoking inspiration image. I originally tried to use the In Bloom Stamp Set for this project but I just wasn't happy with it. I'm a little disappointed that I didn't come up with a new original design. But this was a case of "don't fix it if it isn't broken". Here's the image I'm talking about. Nichole talked about how much she loves this image; the colors, the layers, the movement and the softness of the colors. While my card doesn't mimic the shapes seen in the inspiration image, my personal feeling is that we have all of these elements in one of the newer stamp sets released at Papertrey Ink. I'm talking about Tulip Time, my all-time favorite stamp set so far. I like lots of others but this set is totally swoon worthy and I haven't ever said that about another stamp set. I don't know if it is even possible to have a stamp set anywhere that I like more although I hope Betsy Veldman continues to create others in this style. It does take a little bit of effort since it is five layers just for the flowers plus any of the little extras you want to add in here like the butterflies, the sequins, the banner and the ombre effect of the die cut. 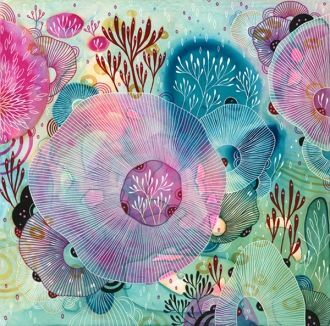 To me, these things portray that movement, the beautiful colors, and the softness that Nichole loved in the inspiration piece. The card front has been misted with shimmer spritz to help give that soft, gorgeous glow and the butterflies were given a touch of Wink of Stella before a 2nd layer was added to some of the elements with the help of embossing powder and Irresistibles. I hope it's evident that I put a ton of thought into this and into all the little details. Even the basic card design is Betsy Veldman's from the latest release. Let's get on with the details! I started by cutting the Noted: Scalloped A2 card base from Stampers Select White card stock. Using my MISTI, I positioned the first layer of the Tulip Time Stamps for the flowers onto the front half of the card base. Since I have the Medium sized MISTI, the card base did fit with no problem. I tried to do the first layer of color using Aqua Mist but I ended up using a pigment ink that I already had on hand for that layer. It is a long discontinued color from Brilliance Archival Ink called Pearlized Jade. I actually stuck my finger directly onto the ink pad thinking it would be bone dry after all these years and when I saw the color, I decided I had to use it. I hadn't really used this ink before and I have to say, I loved the fact that when you stamp with it, what you see is what you get. Dye Inks dry back a lot and settle into the paper and soften as they get completely dry. Not so with Pigment Inks. I know that in real life there are no tulips this color but that is one of the great things about art. It doesn't have to imitate life "exactly" and is open to interpretation. The 2nd layer of color for the blooms is done using Hawaiian Shores and the 3rd layer is Tropical Teal. The leaves were stamped using Vintage Jadeite and New Leaf inks all from Papertrey Ink. For the butterflies, I mounted those on small 1-inch acrylic blocks and stamped them by hand in the Jade as well. I gave them a quick tap with Clear Wink of Stella. The larger of the butterflies has a layer included in the stamp set so I stamped the second layer in Versamark and then I used a Versapen to create the 2nd layer for the smaller butterfly like the stamp in the set. After that I sprinkled them with WOW! Neutral Ultra Shimmer Embossing Powder and heat set it. This is an iridescent embossing powder that shimmers similar to Judikins Iridescent Sparkle. I'm putting in a couple of extra pictures so that hopefully you can see the extra touches I added. The banner is cut from Stampers Select White using the Paper Clippings: Happy Birthday Details die set. I attached it with 4 foam squares done the center and two thin foam squares on each end. 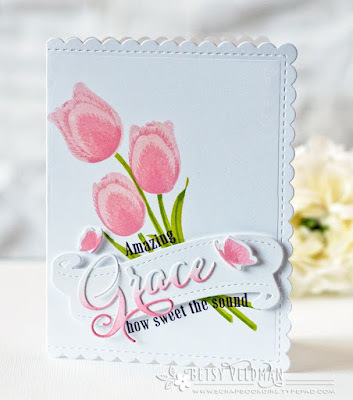 "Grace" is from the new Inspired: Grace Die also by Betsy Veldman. I love this font with it's classic and elegant style. Using a mini ink blending tool and the pearly Jade ink, I just kind of laid my finger across the top third or so of the die cut to give it that Ombre look and then went around the outside edge of the card front as well. I attached the word die to the banner with Multi Medium Matte. To finish up my card I scattered a few Darice Iridescent Crystal Sequins in the 5 mm and 8 mm size, attaching them with Ranger Multi Medium Matte. Even though the Multi Medium dries clear with a matte finish, it bugs me when the glue squeezes through the little hole in the center so I put a very tiny amount of Shimmer Irresistible Pico Embellisher on the inside of each sequin and set it aside to dry. This is totally unnecessary but it makes me feel better. 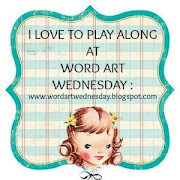 Be sure to stop over at the Papertrey Ink June 2016 Blog Hop to see everyone's interpretations of the inspiration piece. 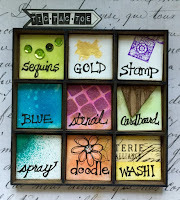 I'll also be entering this over at the Simon Says Stamp Wednesday Challenge for the "Add some Shimmer" challenge. Thanks for stopping by today and I truly enjoy and treasure each and every comment you leave for me. Have a great weekend everyone! Hello everyone! Last week I won The Color Throwdown Challenge #396 which means that this week, I get to be the guest designer for The Color Throwdown #398. Using lots of bright color is always somewhat of a challenge for me so when I saw the challenge graphic, I knew I had to really get into gear and use some color! This image has some cool refreshment on a hot summer day and I wanted to be equal to that challenge. Doesn't it look just divine? For my challenge card this week, I started with some Canson Bristol Watercolor Paper and the Papertrey Ink Painted Petals Stamp Set. I had only used a sentiment from this set previously but I really wanted to give it a good test run for this card so I also pulled out my MISTI. One of the things I really like about using the MISTI is the ability to double stamp everything to get a really vibrant concentration of color. This was just the thing I was looking for to create this card. The colors in the inspiration image are soooo vibrant and I wanted to create a card equal to that. 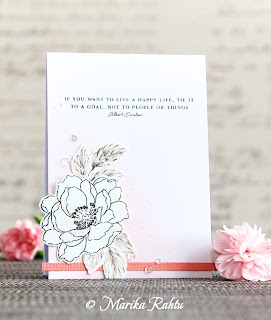 The Painted Petals Stamp Set has 4 different flowers with between 4 and 5 layers for each one. 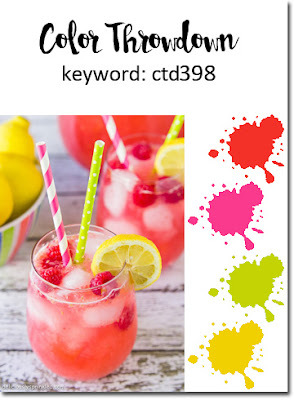 It's a way to use layered similar colors on an image. The color interpretations for the challenge are Red Raspberry, Hot Pink, Lime Green and Yellow but I also threw some coral into the mix. You don't have to use the exact colors, just something in that vicinity. My flowers are a combination of Hibiscus Burst, Berry Sorbet, Pure Poppy, Scarlet Jewel, Raspberry Fizz, Vintage Jadeite with some Gold Embossing tossed in there for the "yellow" in the flowers. I used SU! 's So Saffron Cardstock for the background panel. By double stamping each of the colored layers, I was able to achieve this very vibrant color and by using the MISTI, I didn't goof them up when I was doing that. 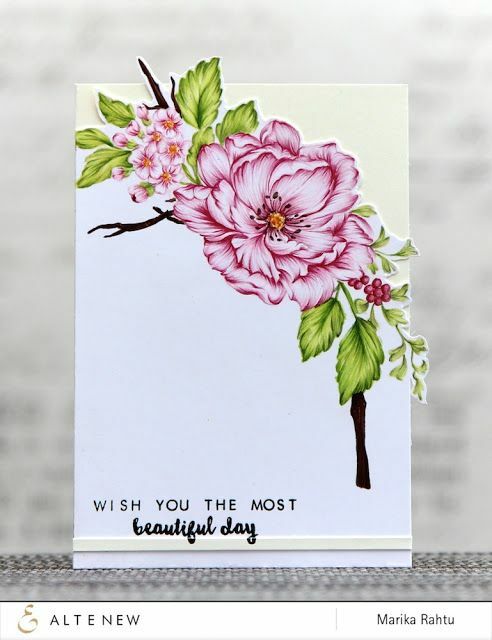 When you use watercolor paper and you double stamp your images, that paper will stay damp longer than usual so don't forget to let the images dry all the way before you add that final layer of heat embossing to the blooms. I almost forgot! Once that part was done, I die cut everything using the coordinating Painted Petals Dies. I made a top folding 5.5 x 4.25 inch card base from Stamper's Select White. This is my absolute favorite, go to card stock. It is #110 and super smooth. Using the WPLUS9 Design Studio Sunshine Layers Dies, I cut a scalloped, stitched rectangle background panel from SU! 's So Saffron cardstock then arranged my flowers. 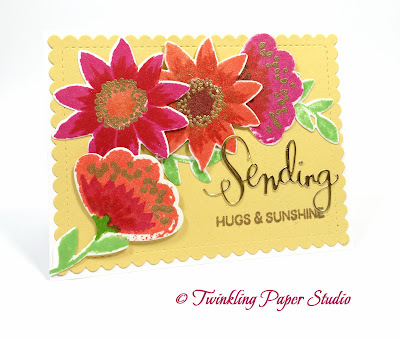 The "Sending" stamp from Painted Petals was a little large for my card design so I used the Simon Says Stamp Exclusive Sending Die with the Sunshine & Hugs sentiment stamp from Painted Petals. I'm thinking of sending this card to a crafty friend in Europe who is not yet into these dog days of summer that we are experiencing here in the Southwest. Have you seen how hot it has been in Arizona this year already? Crazy weather for sure. If it's 115 actual degrees, how hot is the heat index? My nephew posted yesterday that it was 115 degrees in Cottonwood, AZ where he lives. That is too hot for me! I hope you all have a great week and be sure to check out the current challenge over at The Color Throwdown. They have a new challenge every Wednesday. I am very slow to get around to this post. In fact, the Simon Says Stamp Wednesday Challenge "Animal Magic" will end early tomorrow morning, so I'm barely making it! I've been in a class at Altenew Academy for the past 6 days and I've been practicing some new techniques. I still need a lot of practice for some of them and in fact my favorite thing that came out of this class was something I had actually seen Marika (our instructor) do before. This was just the first time I had tried it. 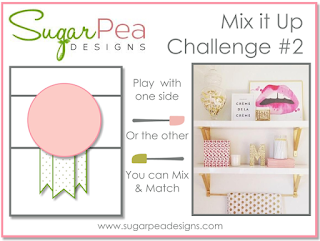 I combined this technique with a couple of elements so that I could participate in these two challenges. On the Simon Challenge, they did say Butterflies to Buffaloes if you're wondering what my animal is. 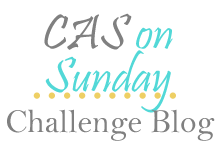 The CAS on Sunday Challenge is "Butterflies". So I combined two of my favorites for this challenge, flowers and butterflies. For today's card, I did the same technique that I used on this card but I stamped both of the detail layers and softened them out with water rather than just the one layer of detail. So, I stamped the outline images in Versamark and heat embossed them using Simon Says Stamp Antique Gold Embossing Powder. Then I stamped the 2 detail layers and softened them up using a water brush. This particular card uses Lavender Moon Ink from Papertrey Ink. It actually works better with pinks than it does with purples for my purposes anyway. But it is a color I love almost as much as my pinks. I also used Lavender Moon Ink to do the ink blending on my background panel but since I misted it with Tsukineko Sparkle Sheer Shimmer Spritz it is also a bit lighter. For that, I used watercolor paper and then die cut it when dry with the largest Simon Says Stamp Stitched Rectangle Die. For the spatter, I used Hibiscus Burst Ink with a very small amount of water and a #4 Round Brush. All of a sudden I'm really into all kinds of "dot" accents and I can hardly wait for my Pico Embellishers to get here so I can try those out as well. I ordered black and gold. I think the black one would have looked great on here but I know I will create another pink card pretty soon, so I will have opportunities to try it. The stamped part of the greeting is from Papertrey Ink's Enclosed: Butterfly Mini Stamp Set and the "Perfect" is a die from Waffle Flower Crafts. The blooms are from my favorite Altenew Set, Beautiful Day and I used the coordinating dies. The butterfly is from Impression Obsession. I really love the look of this softened ink and I have another project in the works using a few different color combinations. This bloom always makes me think of Wild Roses. Everything was attached to an A2 Top Folding Notecard made from Lavender Moon Cardstock. I have so enjoyed Marika's class this past week. I feel like the small details I put into my cards may not be visible on first glance, but probably will be on the second glance. It's okay if they aren't because I enjoy the entire process and people do love to get a handmade card. For me, that is what it's all about. Thanks so much for stopping by to check out my project. Have a fantastic week everyone! 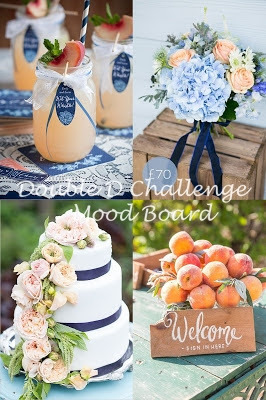 I am popping on here this morning with a super quick post. I'm in a class this week and have homework to do for it. The Simon Says Stamp Monday Challenge for this week is World Traveler. I have been wanting to get a sailboat die for quite a while now but every time I go to buy the one I want, they are sold out, so I improvised. I cut each piece of this sailboat by hand after loosely sketching it onto Stamper's Select White. I used several dies to create the scene in ways not originally intended. After I cut the pieces for the sailboat, I cut three set of scallops but used the negative pieces to create my ocean waves. For the boards of the boat, I used my score board and bone folder then used a mini ink blending tool with some Spring Rain Ink to highlight the creases. Next I used the Mama Elephant Landscape Trio to cut the white "clouds" then lightly inked up a white panel with Spring Rain Ink to be the sky background. The sunshine came from the WPLUS9 Sunshine Layers Die Set. All in all, I'm pretty happy with this card because while not as great as a card created with a sailboat die cut, it is passable enough to give to my husband for Father's Day. Enjoy your day everyone. I'll be linking this card up over at the Simon Monday Challenge Blog. One of the best things about this industry is the ability to take online classes to learn new techniques. There are some fantastic artists of all kinds who inspire us and share their techniques with us. I am currently in a class with someone whose work I have admired for about a year now, Marika Rahtu. She creates incredibly detailed cards by adding pen or pencil work to stamped images. As you can see, the amount of detail is incredible! So when I saw that Altenew Academy was having a class called "Beautiful Details" that she was teaching, I jumped on it. I found Marika through the Altenew Blog because she is a member of their design team and started doing some video tutorials for them. I have been a fan and subscribed since day one of finding her. While I am not nearly as good as Marika, I have been practicing a bit since March of this year and I can say with a great deal of satisfaction that I no longer stink at this. *Ü* Practice does indeed help. Marika's attitude is that in any practice we learn something for the next time and I have found that to be true. Marika is not trained as an artist, nor is she "Copic Certified". She is teaching and sharing those things that have worked for her from her personal experience. And really, I think those methods are the best anyway. Our homework for the Day 2 lesson was to color something. Yep, that's it. I love to watercolor and I'm trying to improve with my other mediums as well. I started by stamping the outline images of the bloom and leaves from the Altenew Beautiful Day Stamp Set in Versamark and heat embossing them using Simon Says Stamp Antique Gold Embossing Powder on a panel of watercolor paper. Since the idea is to add details using water soluable inks, the watercolor paper is a must. 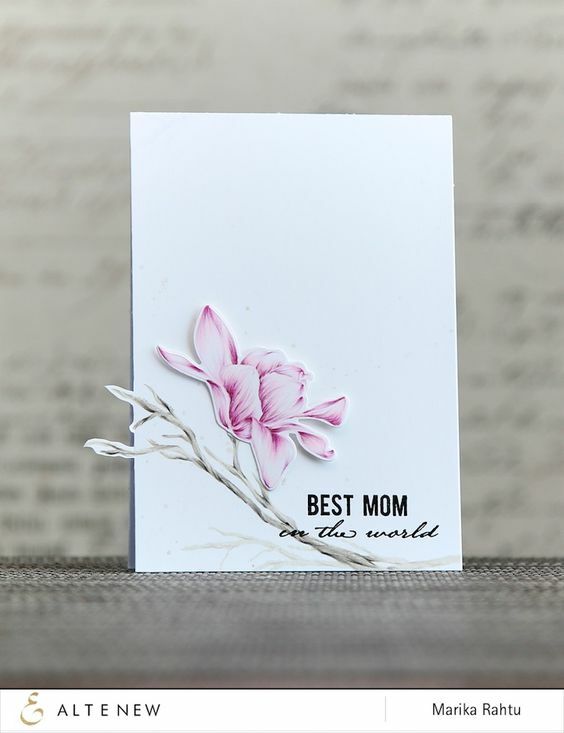 This stamp set is a layering set with 4 layers for the blooms and 3 for the leaves. Starting with the flowers first, one at a time, I stamped the 2nd layer of details using Lovely Lady Ink and then softened all of that with a waterbrush. I learned this trick from watching Marika and I love how soft and sheer the color becomes when you do this. It works best if you stamp one image, work it with a waterbrush (it takes almost zero effort) and then stamp the next one. These inks don't work the same way Distress Inks do, so I only do one bloom at a time. A lot of the dye inks become waterproof once they dry while Distress Inks are made to react with water. It's easier to just work with one small area at a time. For the leaves, I smooshed Ocean Tides Ink onto an acrylic block and picking it up with a water brush, painted the leaves. I just go in and add additional layers after the previous layer dries. Once those were done and my paper was completely dry, I cut them out using the Altenew Beautiful Day Coordinating Dies. For the background panel, I did ink blending using a Mini Ink Blending Tool with Hibiscus Burst Ink, working on the diagonal from upper left to lower right. When I had that done, I mixed a tiny bit of water with Raspberry Fizz Ink on an acrylic block with a #4 Round Brush and splattered the darker color onto my background panel for added visual interest. Then I assembled everything to a top folding A2 card base made from Stamper's Select White. This card uses supplies I already had on hand but if you are looking for any of the products, I have them linked for you. The stamps & dies are available through Altenew or Simon Says Stamp. The papers and inks are from Papertrey Ink's Perfect Match line of coordinating inks and cardstock. I used Canson Bristol Watercolor Paper for this project which is available online at Amazon or at Hobby Lobby. I take mine to Kinko's to be cut when I receive it. Have a great weekend everyone. I'll have more projects to share in the next week or two from this class so I hope you'll come back then. If you subscribe to my blog via e-mail, you'll always get a notification that I have a new post up on my blog. You can also find me on Instagram and at Twinkling Paper Studio on Facebook. I hope to see you there! I'm guessing that it won't be too hard to figure out who inspired me for this June 2016 edition of the Papertrey Create Along With Us Challenge. I always love and enjoy all of the cards and projects that are seen but Betsy's card made me say "WOW" even though no one was home to hear me. I have loved these tulips since their introduction a couple of months ago and I've used them quite a few times by now. This is the first time that I've used them directly on a white panel without die cutting them first. I (somewhat surprisingly) like the look. And isn't that banner die incredible? Since Pink is my favorite color, I am excited to be able to order the new color, Pale Peony, tonight. It should come as no surprise to those of you who have been to my blog a few times that Pink is also my most used ink color. In fact, I use it so much that I feel the need for ink refills to be on hand. Noted: Scalloped A2 die/collection will be available for purchase on June 15th. It will retail for $39. I want all three of the sets, but I'll have to acquire them one at a time. The great thing (or maybe not so great) is that the A1 dies don't work with the A2 dies or the Square and Vice-Versa. I like knowing that up front before I order because it is very frustrating to think they all work together and then when they get to your door, they don't. Betsy let us know on the forum that they weren't designed to work with the other sets. Each set has its own included dies which is why they are at a higher price point. I think it is a very good value for all that you are going to get with each one. There are a total of 9 dies in the A2 set. If you decide to get this set, you will need the extended cutting pads if you own a Cuttlebug. I had gotten one with the Don't Forget to Write Kit. Thank you so much for stopping by today. I hope my card inspires you as much as Betsy's did me. I like this so much, I am planning to do a few versions in a few colors over the next few days. For now I just want to get it posted over at the challenge at Papertrey Ink. 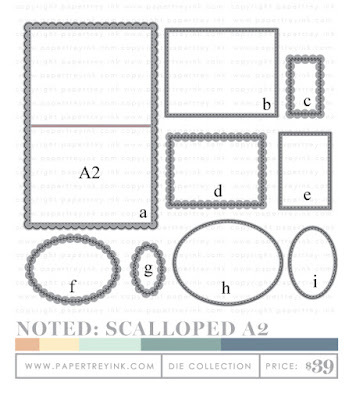 You can find all of the supplies I've mentioned at the Papertrey Ink Store. There's a blinkie in the sidebar to the right. Enjoy the rest of your evening and come back soon to visit. Today's card is for the Simon Says Stamp Wednesday Challenge Blog for Father's Day/For a Guy and is inspired in part by a card I saw at another challenge and is also for the Color Throwdown Challenge #396. I only have one stamp set specific to Father's Day so I was trying to figure out what I wanted to make. Especially when it comes to masculine cards, I love to use really bold graphics with very clean lines. For this first card I started with a panel of watercolor paper that I cut into triangles. I first cut a 4.25 inch tall rectangle and then cut that piece again from corner to corner. I turned my paper a quarter turn and I cut a second rectangle then cut that from corner to corner and so on until all of the triangles were cut. I didn't measure, I just eyeballed it. This makes enough for two cards with five triangles for each card. For my second card I used scraps of cardstock and just cut random triangles instead of ink blending them. Either method is super easy and looks great. It's a bonus to be able to use some of the many paper scraps we create as cardmakers. 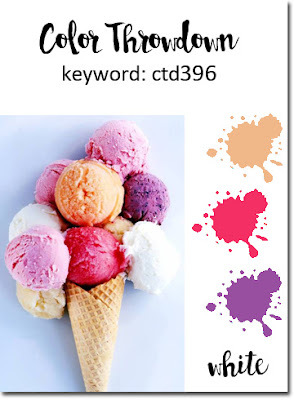 Since this first card is for a Color Throwdown Challenge of raspberry, plum and peach with white, I ink blended dark and light versions of the raspberry and plum colors to create the extra colors so that each triangle on the card would be different. The darker ones just have more layers of color. I used SU! Raspberry Ripple & Crisp Cantaloupe, with Seedless Preserves Distress Ink. There is no rhyme or reason at all to the design of these graphic pieces. I just laid them down one by one until I liked the arrangement on the card front, then laid a piece of Press 'N Seal over the top to keep the arrangement in place, pulled that off of the card base and flipped it over so I could add the glue (Ranger Multi Medium Matte) to the back of those pieces and laid it back down. 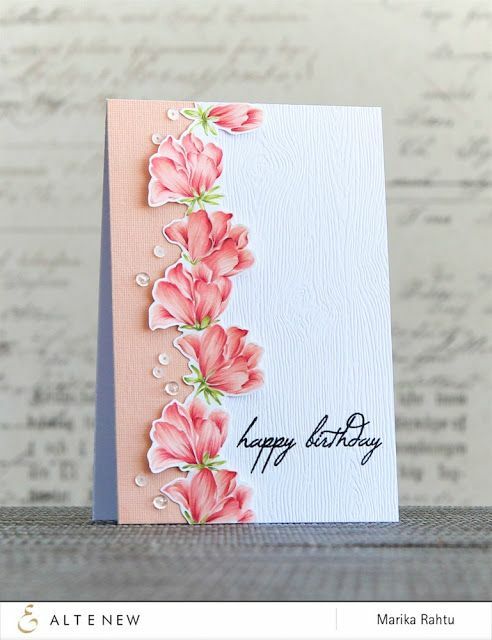 This particular card base is made from Rustic White Cardstock by Papertrey Ink. Once I had it down and in place, I held it there for a few minutes to let the glue set a bit, then peeled the Press 'N Seal away. This is also how I arrange the Tulips from Tulip Time or any other floral arrangement. This is not my idea; it is Laurie Willison's. However, it just so happens that Jennifer McGuire's husband invented Press 'N Seal. For the "Happy" part of the greeting, I used some Stick-It Adhesive and sandwiched that between a layer of fun foam and gold card stock to cut the dimensional element. The dies are PTI's One Liners: Happy Die Set. There are 4 different versions of the word "Happy". The fun foam temporarily squishes down when you die cut it, but pops right back out a minute or so after die cutting. The banner is from the Tag Sale: Quilted Die and the "Father's Day" is from Boutique Borders: Father Mini Stamp Set. I performed a bit of stamp surgery to separate the "Happy" stamp word from the "Father's Day". This is a super easy card to duplicate and make multiples of. For this second card I used a less "clean" looking die cut but I still like how it looks. There are 4 to choose from in this set. For the card base, I used Papertrey Ink's Enchanted Evening Cardstock. The other cardstock colors that I know are Papertrey Ink's Tropical Teal & Vintage Jadeite, Simon Says Stamp's Mint Cardstock, SU's Night of Navy and Creative Memories Sea Glass. Thank you so much for stopping by today. I hope you enjoyed my card and can join me again sometime. I'll be back with another project soon. Hello everyone! I have a really fun card to share today. 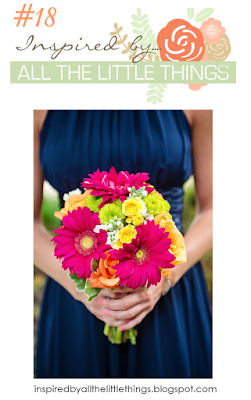 I love this photo that was shared as our inspirational image on Inspired By All The Little Things for the #18 Challenge. While I did struggle a little to find something that I felt worked for this, I liked it so much that I made three cards in the same design, one with a different color. I also really love it when I can use multiple items from different manufacturers and pull them together on one card as is the case with this card. I started by die cutting a few of the tulips from Stamper's Select White Cardstock for my previous project. If I am going to the trouble of doing one set, I always make an extra few sets while I am at it and then I have some ready to go for another project. I used my MISTI Tool for stamping all of them; three layers for the blooms and two for the stems. For this particular set I used Papertrey Ink Perfect Match Inks in Lovely Lady, Hibiscus Burst and Raspberry Fizz. For the leaves I used Papertrey's Vintage Jadeite with Mowed Lawn Distress Ink. I love adding a touch (or more) of gold to my projects and I remembered I had this Navy and Gold Foil striped paper and felt it would be the perfect elegant touch to go with the inspiration image which is clearly from a wedding. I created a top folding A2 notecard from SU! Night of Navy Cardstock. The outer ring on the greeting is from Papertrey Ink's Stamp-A-Faire - Rennasiance Kit. This is a no longer available item but you can watch for it on the For Sale or Trade Board at the Papertrey Forum which is where I got mine. I didn't have any idea that Papertrey Ink existed in 2014. I only discovered them in 2015. I love the detail in this die and when I realized I could pair it with the Smile Circle Die from Simon Says Stamp, I actually squeeled outloud! Since I wanted to add a bit of dimension to my card, I also cut a circle of the navy cardstock to go behind the Smile Circle. My card assembly was super easy. I wanted my flowers to frame the sentiment so I adhered the outer ring die cut from the Rennasiance Kit directly to the striped panel using Ranger Multi Medium Matte. I adhered the circle smile die to the blue cardstock using the same glue. To pop up the sentiment a little, I used Thin 3D Foam Squares and centered it over the background ring. After that I arranged my tulips how I wanted them on top of the panel then applied Thin 3D Foam Squares on the back of them and placed them onto my card front. This is such an elegant looking card and I loved combining my supplies to get these results. I adhered the background panel to my card base using Scor-Tape (Sookwang Paper Tape) in a ⅛th inch width. It's available in several widths and it's a very strong adhesive. Sometimes I grab what is at my fingertips so right now I have the scor-tape on my desk. It's also nice because you can just tear it and don't have to sit and measure each strip of adhesive out. It is a very strong dry adhesive. I also made a second card with this same design using cardstock in Berry Sorbet, Gold Metallic Poster Board and Kraft. 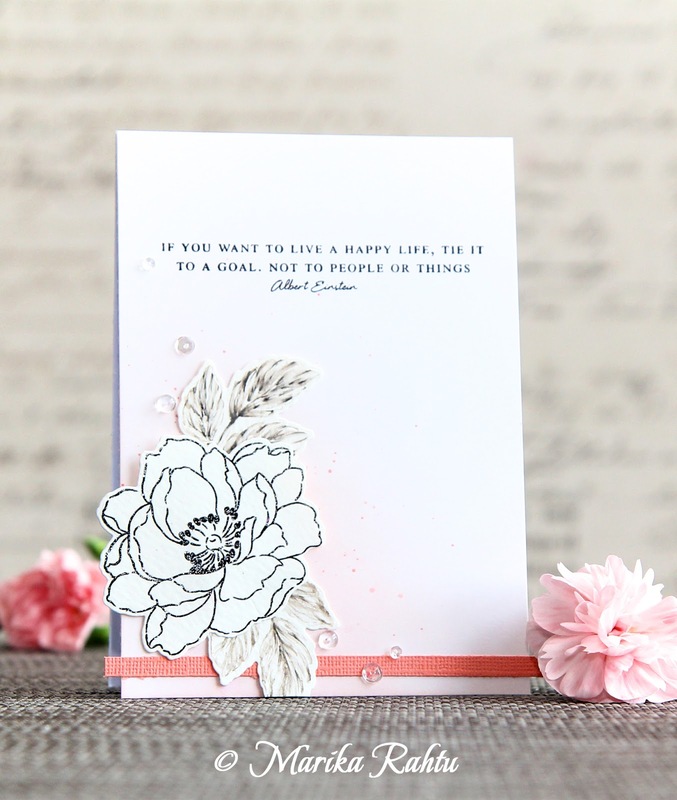 The tulip blooms are stamped in Sweet Blush, Berry Sorbet and Scarlet Jewel Inks. For the butterfly, I like to put a narrow strip of foam adhesive down the body until it thins out and then put a bit of adhesive at the bottom of each wing to make it appear as if it could take flight at any moment. This butterfly is from Impression Obsession and is my favorite. I have two or three others but I reach for this one over and over. In fact, it has a special place on my table and never gets put away. If I'm going to use a butterfly, I want this one called "Fancy Butterfly". It is a two layered image but I often use only the top layer like you see here. The other part of it is the solid image. I'm entering this second card over at the Simon Says Stamp Monday Challenge for their theme of Summer Garden. Yes, I do know Tulips are more of a springtime flower, but the are gorgeous and can be enjoyed anytime! You can see lots more inspiration over at Inspired By All The Little Things. Thanks so much for stopping by today. I'll be back with a new project very soon! Hello there! I have to say that I love challenges where we can use the inspirational photo, the sketch or we can combine the two into one card. They are my absolute favorites and I never know which way it will go until I am very nearly finished with my project. 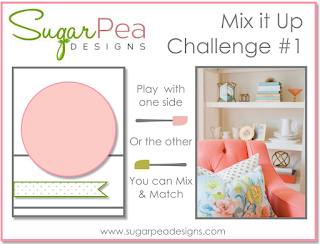 I love the colors in the Sugar Pea Designs 1st Challenge inspiration photo but I also really like the sketch so I wanted to include a little of the sketch into my project as well. I am inspired by the colors, but they aren't a new combination for me. My mom bought her house almost 32 years ago and the bathroom has Peach/Coral and Blues. It has always been a lovely combination. In fact, it is so lovely that Double D Challenges has the same color combination this week. 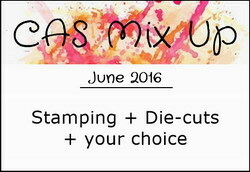 Plus I'll be able to include the CAS Mix Up Challenge using Stamping, Die Cutting and Sprays, Stamping Royalty #332 with Flowers as the theme and Word Art Wednesday which is always Anything Goes. I don't know if I've ever been able to participate in so many challenges with just one card! When I sat down in my studio yesterday my first project for the day was to create a page header for my blog. I wanted it to be mine, not just some random text I could put in the little form box. I'm happy to have that done. I've been thinking about it for a while. While I was sitting at my computer I was thinking about a thank you or encouragement type of card I wanted to make to send to a scrappy friend that lives in Europe. I use the term "scrappy" because I started as a scrapbooker 20 years ago and those friends were "scrappy" friends. I think most card makers refer to them as "crafty" friends. 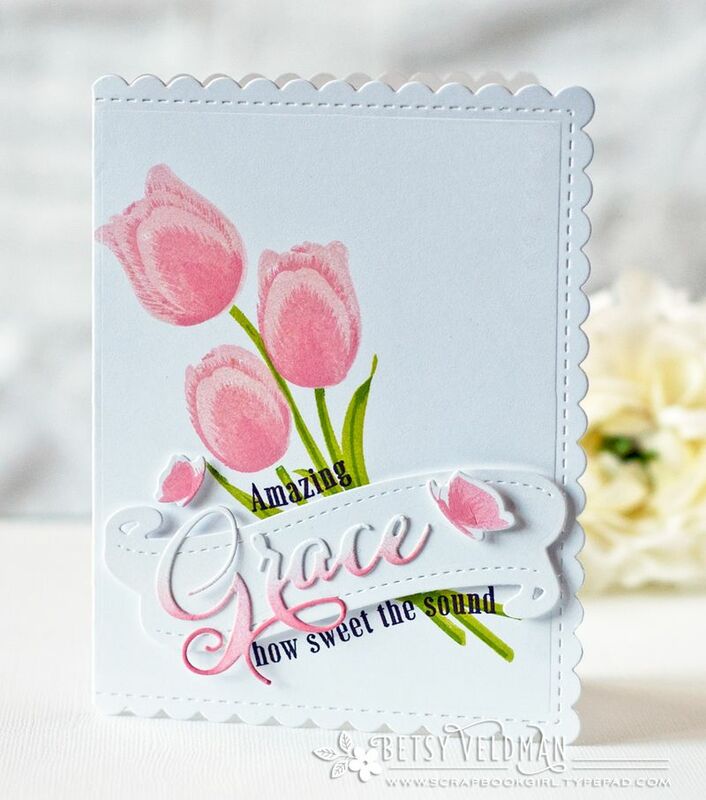 This particular person does a lot to share her knowledge and expertise with others who are getting started making cards and her YouTube videos are top notch all the way. I have followed her blog (and YouTube Channel) from the first time I saw a video that she had done when I got seriously into making cards last year in August. Although English is not her first language, she speaks it incredibly well. She is on several U.S. design teams and I love her style. It is classic and elegant even when she is working on something more cutesy. It's a style I mimic in my own projects. 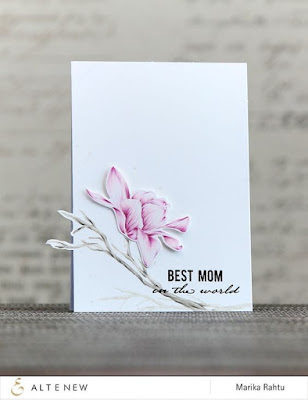 I was trying to think about the card I would make for her and I wanted it to be different than the things she uses and has access to which meant using a stamp set from Papertrey Ink. Once I did that, it was easy to determine which one I would use; Tulip Time wins out almost every time. I started with an A2 top folding note card made from Papertrey Ink Rustic White Cardstock. I wasn't sure I would like this cardstock even after it arrived but now I wish I would have ordered the bigger package as I've used it several times and only have about 5 sheets left. It's a soft white with little flecks of color in it. It's a nice alternative to crisp bright white without having to go with cream cardstock. It's the one I will use the way other cardmakers use Kraft. I spritzed two 4.25 x 5.5 inch panels in Sea Glass (a Creative Memories paper) and Berry Sorbet with Tsukineko Sheer Shimmer Spritz and set them aside to dry while I was working on my other elements. To stamp the Tulips, it definitely called for my MISTI Stamping Tool. I cut the die cut pieces from Stamper's Select White and then used the negative in the MISTI to hold those pieces in place while I stamped all of the layers. There are two layers for the leaves and three for the tulips. I used Spun Sugar, Abandoned Coral and Picked Raspberry Distress Inks for the blooms and Papertrey's Vintage Jadeite with Mowed Lawn Distress Ink for the leaves. I grouped them together using a combination of Ranger Multi Medium Matte and Thin 3D Foam Squares. I wanted to get the bow tied around them before I attached the bouquet to the card so that was next. On the back side of the bouquet, I used a little Glossy Accents to keep the ribbon in place. I die cut the frame from Spellbinders Labels 42 and Labels 42 Decorative Elements. You have to have both sets to get the frame but you could also use just the label without the center cut out of it. Look through the dies you already have to see what you have that would work as a frame or label. Next I die cut the Sea Glass and Berry Sorbet panels using the largest Simon Says Stamp Stitched Rectangle. I re-aligned the sea glass panel back into that same die to take a bit more off of 2 sides rather than going down to the next size die. This allows a narrow mat all the way around the panel. Then I started assembling everything to the card base. I used Scor-Tape (Sookwang Paper Tape) on each of the background panels and adhered them to the card base as well. For the tulips, I know the person I am sending this too really loves to have dimension on her cards so I used Foam Squares (Thin and Regular) to add dimension to the gold frame, the bouquet, and the little banner across the front. I die cut the Waffle Flower "Awesome", adhering that and the little heart using Ranger Multi Medium Matte. The little hearts are the extras I keep in the (real) Vintage Jadeite bowl that sits on my desk. I use this Mini Hearts Die a lot and there are always extras from that die in my little bowl of leftover pieces. This finishes up today's post. Thank you so much for stopping by and I very much appreciate it when you take time to comment.